The bowl of potatoes glowing the flavor is a good image, but you can't help thinking the bowl isn't needed and a ketchup graphic could help. There really isn't much else to criticise with what is an otherwise bright and highly noticeable modern, basic and well designed bag. The Chips are fairly thin, which enables a crisp crunch rather than a solid crunch which you would find with a Barrel O' Fun Wavy Chip. It doesn't feel overly oily and the crunch remains consistent once it is in your mouth. 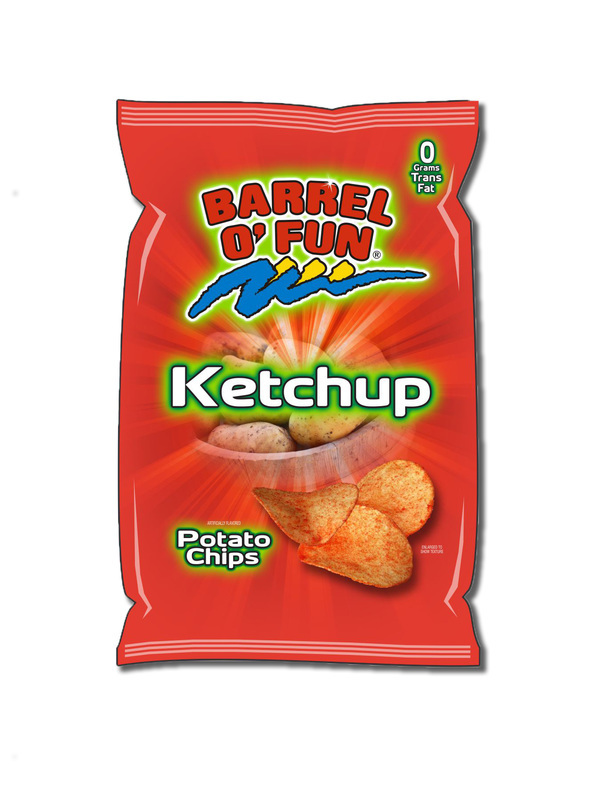 The most notable aspect of this Chip are the red flecks, which is presumably ketchup seasoning powder. There were also bits of skin evident on some edges, which adds a real and fresh feel. The seasoning remains on the fingers without the aid of unnecessary grease. Open the bag and a strong ketchup smell immediately erupts, which is great because it lines you up for the flavor ahead. The flavor is much the same, a tangy and sweet ketchup taste.